The Canid Project is currently comprised of a network of creatives from the United States, England, Wales, and Canada, as well as biologists, conservationists, wildlife rehabilitaors, and wild canid enthusists. Meet our current team. Amy Shutt specializes in wildlife photography with a focus on conservation story-telling projects. A formally trained and published photographer, Amy also leads conservation-based wildlife photography workshops throughout the United States, Canada and Africa. Her interest in wild canids, canine domestication, biology, and her curiosity about the human and wild animal relationships in our world, brought her to start The Canid Project. She hopes to preserve, educate, and inspire through this endeavor. David Lloyd is a wildlife photographer from New Zealand living in London. David has seen his images published widely, in the press and in several photographic monthlies. He has also enjoyed success in major competitions including a finalist in the BBC Wildlife Photographer of the Year on several occasions, European Wildlife Photographer of the year, Nature's Best Windland Smith Rice, and a highly commended in the British Wildlife Photographic Awards in its inaugural year. David gained a specially commended award in the Veolia Wildlife Photographer of the Year competition with "A Flick of the Tail", a black and white image of a giraffe which was also chosen for that year's annual portfolio cover. He spends up to 16 weeks in Kenya a year photographing the wildlife of the savannas. In 2014 he published his first book featuring some of these images titled As Long As There Are Animals. David works to show the individuality, vulnerability, strength, emotional life, familial ties, and the unwavering spirit of his wildlife subjects. Ashleigh is a young conservation-focused wildlife photographer with a love for predator species. After her family moved to the New Jersey country when she was 8, Ashleigh discovered a fascination and love for the red foxes that she shares her property with. Photography allowed her to capture their behavior and stories and since, Ashleigh has gone on to be recognized by some of the top Youth Wildlife Photography competitions in the world: Wildlife Photographer of the Year, Nature’s Best and Por el Planeta. Ashleigh has used her images and stories to promote predator awareness and conservation. Ashleigh hopes that her conservation-focused stories and images of foxes can help give a voice to these endearing and often misunderstood creatures. Brittany is a wildlife photographer based out of New Brunswick, Canada. The love for wildlife started at an early age, and remaining consistent throughout the years leading her to study photography at Mount Allison University. Over the years, she has photographed many different species, but the Red Fox holds a special place in her heart. Brittany’s work has been published by Canadian Geographic, The Canadian Wildlife Federation, Canadian Wildlife Magazine and online at National Geographic. Brittany also donates her prints to wildlife rehabilitation centers such as Hope for Wildlife and The Atlantic Wildlife Institute for fundraising for wildlife in their care. Brittany’s goal is to capture intimate moments that tell stories that inspire people to protect this precious fauna. Dot began to pursue photography as a hobby after retirement from the Louisiana Department of Transportation and Development. During her 30-year tenure she helped to create and administer the Statewide Flood Control Program and the Port Construction and Development Priority Program. These programs are funded at $40-$50 million annually. She now enjoys photographing wildlife and nature. Dot and her husband spend a lot of time in the Great Smoky Mountain National Park always hoping to capture the perfect photo of a black bear. 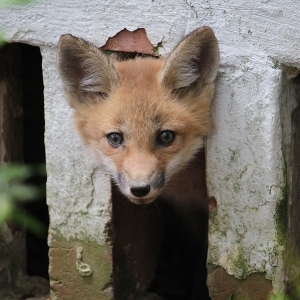 She became fascinated by red foxes after discovering a den under her house and loves photographing the appealing faces of fox kits and their clown like antics. Dot contributes to the The Canid Project by helping to monitor, document, and photograph the fox family and their behaviors in her area. Her writing on her fox experiences will also be featured in The Canid Project's 2018 Periodical. Tin Man Lee is a celebrated wildlife photographer producing work that is easily recognizable. Tin Man has an amazing talent forcapturing special moments of wild animals as they interact with one another and with their natural environments. His persistence is admirable and his vision is refreshing and unique. Wildlife photography rekindled the deep love of wild animals and nature he felt as a child. Through this art form, he found an outlet to express his feelings and reveal his dreams. He hopes that through his wildlife photography he can stir the viewer's emotions to bring awareness to the animals he photographs, and in turn help to save the precious wilderness that remains on earth. Colleen is a wildlife and nature photographer based in Calgary, Alberta, Canada. She is passionate about photographing wildlife in their natural surroundings, from the Rocky Mountains to the prairies. Colleen’s hope is that her images will help foster a connection between the viewer and her wild subjects, raising awareness to protect both the animals and their natural habitats. She strongly believes in ethical photography practices and all of her images are of wild animals only – nothing captive or baited. Daniel Dietrich is a full time wildlife photographer living in Point Reyes, California. His commitment to ethics in wildlife photography is of the utmost importance to him. To Daniel, the story behind any image is much more important than the final image itself. The beauty comes from watching, learning and understanding an animal’s behavior long before clicking the shutter. Daniel sits on the ethics committee for the North America Nature Photography Association (NANPA). He owns and operates Point Reyes Safaris, a wildlife photography tour company. Samantha Stephens is a visual storyteller based in Ottawa, Ontario, Canada. She uses her wildlife photography paired with compelling written narratives to communicate scientific research, especially when that research is relevant to conservation issues. Trained as a biologist and a recent graduate of the Environmental Visual Communication program, she hopes to foster appreciation for the natural world and the work that helps us understand and protect our shared planet. Julie Amador is a photographer based in Baton Rouge, Louisiana. She volunteers with local animal rescue groups and uses her photography to help the animals find homes. Julie is drawn photographically to nature and animals as her main focus. Julie contributes to The Canid Project as not only a contributing photographer, but she is also the exclusive documentary photographer focusing on the Louisiana team's efforts, working side by side with Amy in the field. She also helps to organize interviews and contacts, and is a key on-ground researcher and collaborator. Max Nichols is a 16-year-old wildlife photographer living in the central valley of California. He grew up reading nature books and watching Planet Earth, and has been in love with the natural world since he was a child. Wildlife photography allows him to channel this love of animals and conservation through artistry, and in addition to his love of photography and pursuit of that “perfect shot,” he is passionate about the conservation of the animals he loves. More recently, he has discovered the families of red and gray foxes with whom he shares his rural home, and this fascination has enabled him to spend many early and late hours photographing them! Max hopes that his images will instill a sense of emotion and awe, helping people around the world to connect with animals they overlook or may never see. Carolina is a 16 year old wildlife photographer living outside of Philadelphia, PA. She is passionate about photography and conservation. Winning the youth category in the 2016 Audubon Photography awards opened many opportunities for Carolina, allowing her to meet and learn from other photographers. Recently she was featured in the Outdoor Photographer of the Year Portfolio II book, and shortlisted in Young Bird Photographer of the year. She hopes that her photos spread awareness about the subjects she photographs and inspire others to protect the earth. Cai Priestly has spent most of his life living in and around his hometown of Cardiff in South Wales. He's had a passion for wild animals and nature from an early age, and he mainly specializes in photographing Canadian wildlife. He took up photography as a hobby after a trip to Africa when he was eleven, and since then, he's been building an extensive portfolio of wildlife images from around the world. In 2008 he moved to Banff in the Canadian Rockies, and has been living there on-and-off ever since. All of his photographs feature wild, free-roaming animals, doing what they do naturally. Nothing captive, nothing baited, and nothing 'called-in'. Dr. Remsen is the McIlhenny Distinguished Professor at Louisiana State University. His expertise is in Ecology, Systematics, and Evolutionary Biology. He received his undergraduate degree from Stanford University and his Ph.D. in Zoology from the University of California at Berkeley. In 2013, Van Remsen received the Brewster Medal of the American Ornithologists' Union for his contributions to the study of the South American avifauna. He has received awards from LSU for excellence in both undergraduate teaching and graduate student advising. In 2016, Remsen was one of the co-authors of the richly illustrated Field Guide to the Birds of Bolivia.